In his address to freshmen, Yale College Dean Peter Salovey said, "The glory of Yale is that at a critical moment in your lives you will be exposed to so many people with different histories who have grown up with varied ways of interpreting experience." 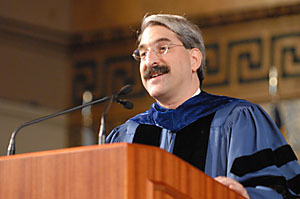 The following is the text of the address presented by Yale College Dean Peter Salovey to members of the Class of 2010 and their families on Sept. 2 in Woolsey Hall. President Levin, Provost Hamilton, colleagues ... Members of the Class of 2010: Good morning and welcome. And to your families and guests: We are delighted you are here, although we apologize that some of you must watch these festivities via video feed in the Levinson Auditorium. But, there is good news: I look taller on television. So, men and women of 2010: All of us know that this is a big moment for you, the start of a tremendous adventure, one that has been a part of the tradition of young people since the academies of Greece and Rome and the great libraries at Alexandria and Ephesus. As it happens, about two months ago, 40 Yale alumni, my wife, Marta, and I stood in front of the magnificent ruins of the ancient library of Ephesus, a Roman city unearthed near Izmir, Turkey, gazing at what was essentially the Sterling Memorial Library of the second century. The library of Ephesus housed more than 12,000 scrolls; our libraries contain about 12 million books and journals. But to be frank, it is our library on Cross Campus -- I'm sure you have seen it -- rather than Ephesus that right now looks more like the site of an historical excavation! Your experience here, linked to this past, may change who you are, as similar experiences have changed the lives of students for thousands of years. And it all begins for you right here, right now. Over the next four years, we will come to know you, not just you in general, but you in particular, from Aaron (all five of them), Abby, and Abra to Zharng, Zoe, and Zoelle. We will, like your families up in the balcony, and the families already missing you in homes around the world, come to know your faces, your voices, your talents, your humor, your quirks and eccentricities, your special geniuses. You will change our lives as we will change yours. This is the beginning of the building of a new and special family, one put together to foster the strength of this community for one primary reason -- so that you can develop yourselves to your greatest potential. And now to welcome you properly this morning, I am going to ask a simple question and draw upon the discipline of psychology, my field of study, for answers. Here is the question: Is your college education made better by the fact that we seek to draw Yale students from the four corners of the earth and from all parts of this country? In the Class of 2010, for example, we have freshmen from all 50 states and 50 countries of the world. You are a group of students representing numerous different cultures, traditions, and accomplishments; you have had many different kinds of experiences in your lives. It seems obvious that casting a wide net helps us to achieve our goal of providing an outstanding education to the very best students, regardless of family circumstances, from anywhere in the world, who can benefit the most from being here. If we use a broad net, we are more likely to catch some big fish. (I apologize if you are wondering if the dean just implied that you are a large-mouthed bass ... or something worse.) We want the world's best students at Yale, and we work very hard to convince you to come here. But why? of experience before in your lives. The difference now is that you will be living so close together and in such an intense intellectual and extracurricular environment. Further, educational systems throughout the world may emphasize the learning of different ways of thinking. Here's an example that I think you will find intriguing. Richard Nisbett is a University of Michigan social psychologist who began his career on the Yale faculty in the 1960s and 70s. Through careful laboratory experimentation, he has demonstrated that individuals who grew up in the countries of East Asia actually learn ways of thinking with different emphases than individuals who grew up in the countries of Western Europe or North America.2 Neither Professor Nisbett nor I intend to imply that all East Asians or all North Americans and Western Europeans are alike. Of course there is considerable diversity within each group of individuals. But family background, schooling, and experience help determine the wonderful differences among human beings, and Professor Nisbett's research provides a fascinating window into one way that this is so. Perhaps you are concerned that the results of this study merely reflect familiarity with different kinds of proverbs, and that students in Ann Arbor versus Beijing simply prefer the proverbs they grew up hearing. So, of course, what we need is another study, this one with Yiddish proverbs and students who speak no Yiddish. The interesting thing about Yiddish proverbs is that some, like the Chinese proverbs, have contradictions in them (e.g., A halber emez is a gantser lign: A half of a truth is a whole lie), and some do not (e.g., Az a leyb shloft, loz im shlofn: If a lion is sleeping, let him sleep). Even for Yiddish proverbs, the students at Peking University liked the ones with contradictions more than did the University of Michigan students. This skill set encompasses more than what is traditionally meant by the term critical thinking, but the idea here is that one should leave college with better honed cognitive abilities that transcend the content of any particular course of study. My lesson for you this morning is that because you will interact in the classroom (and outside of it) with fellow students whose experiences have taught them to think in different ways, you will learn to think in new ways. This is a fantastic gift that you provide each other. You will grow as you become aware that your classmates sometimes approach common challenges in ways that are incompatible with yours but actually lead you to revisit, question, and either revise or reconfirm your views. The opportunities for growth will come not simply because you will learn to appreciate different thinking styles but because you will become increasingly sensitive to individuality, avoiding assumptions about those who seem at first to be like you as much as those who seem very different. A diverse student body does more for undergraduate education than fuel common-room debates in the late evening hours -- as enjoyable as it might be to argue with one's roommates about whether the best dumplings are shumai, empanadas, pierogies, won-ton, vushka, mandu, samosas, boulettes, gnocchi, hushpuppies, or kreplach! Rather, a heterogeneous class changes the nature of everyone's educational experience by providing a challenging environment that fosters learning and creativity. I hope I have made clear there can be enormous variability among individuals in thinking styles within any group of people (which is why it is so dangerous to stereotype). And there is nothing fixed or essential or biological about learning to think in different ways. All of you chose Yale for its reputation as one of the great universities of the world. 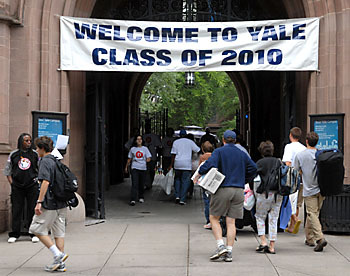 But you also chose it from all the others because of the reputation Yale has for classroom experiences, residential college life, and extracurricular richness that place its students in contact with so many different kinds of people. Here at Yale, you will form a community that allows you to trust each other and share your unique attributes, skills, and styles of thinking. Ladies and gentlemen of the Class of 2010: I am confident that you will enjoy your classmates' companionship on this great adventure. We will be with you, enjoying your companionship as well, and doing all we can to make the voyage rich and joyous. On behalf of everyone on this stage this morning, welcome to Yale! 1. Sternberg, R. J. (1997). Thinking Styles. New York: Cambridge University Press. 2. Nisbett, R.E. (2003). The Geography of Thought: How Asians and Westerners Think Differently ... and Why. New York: The Free Press. The experiments described and cited are also summarized in this very readable book. 3. Masuda, T., Nisbett, R.E. (2001). Attending holistically versus analytically: Comparing the context sensitivity of Japanese and Americans. Journal of Personality and Social Psychology, 81, 922-934. 4. Ji, L., Zhang, Z., & Nisbett, R.E. (2004). Is it culture or is it language? Examination of language effects in cross-cultural research on categorization, Journal of Personality and Social Psychology, 87, 57-65. 5. Peng, K., & Nisbett, R.E. (1999). Culture, dialectics, and reasoning about contradiction. American Psychologist, 54, 741-754. 6. Committee on Yale College Education (2003). Report on Yale College Education. New Haven: Yale University (for the full report, see www.yale.edu/cyce).